In business, location is critical for success and it is no different for Massage Therapy. 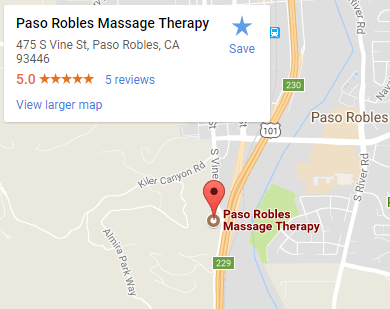 We are conveniently located only about a mile from downtown Paso Robles; however we are outside the city limits. This means we avoid rent, city taxes and fees that inflate the “cost of doing business” inside the city limits. Some businesses cut costs by massaging for 50 minutes and charge for 60. Not us. We just pass the savings of a lower business overhead on to our clients while giving a high quality massage for the full time they pay for. If you are a member, use the button below.